Who has kissed the most cobras? Eaten the most live scorpions? Sailed highest on a skateboard? Been stuck the longest in an elevator? These and 21 other vexing superlatives are the subject matter of this zany collection of verse by one of America's most well-loved poets, J. Patrick Lewis. 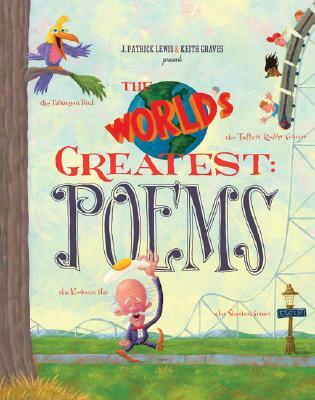 Comic illustrations by Keith Graves make this the funniest, wackiest, rhyming-est book on the shelf. J. Patrick Lewis is the award-winning author of more than 55 books for young people. His poetry and nonsense verse have appeared in dozens of magazines and more than 70 anthologies, and he is a contributor of children's book reviews for the New York Times. He lives in Ohio. Keith Graves is the author-illustrator of several books for children including Frank Was a Monster Who Wanted to Dance and Pet Boy. He lives in Texas.